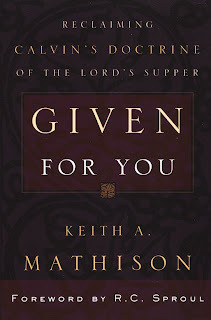 stylos: Book Review: Keith Mathison's "Given For You: Reclaiming Calvin's Doctrine of the Lord's Supper"
Book Review: Keith Mathison's "Given For You: Reclaiming Calvin's Doctrine of the Lord's Supper"
There is a current revival of interest taking place in Reformed circles in the doctrine and practice of the Lord’s Supper. A friend and colleague in Reformed Baptist pastoral ministry recommended this book to me as an important resource in this ongoing conversation. The author works for Ligonier Ministries and as an editor for Tabletalk magazine. In his forward, R. C. Sproul says that after reading the manuscript he told Mathison, “You may die now” (p. x). He explained that even if Mathison wrote nothing else in his life this book would provide a lasting legacy for generations to come. 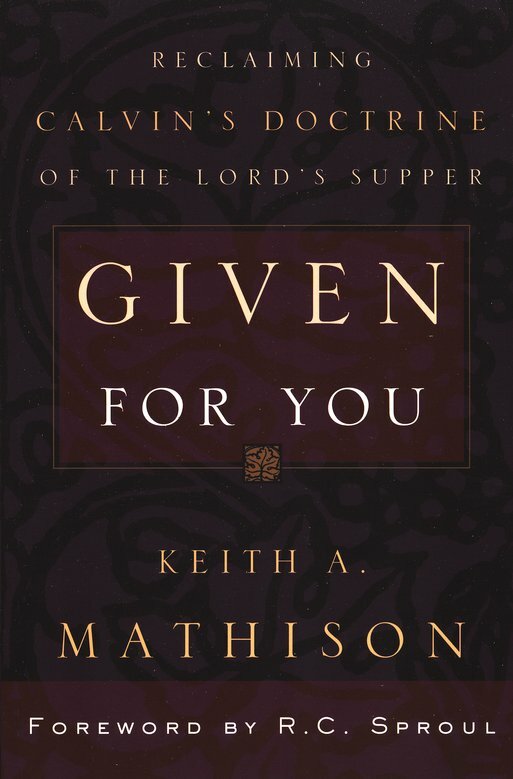 Mathison prefaces the book by noting that his purpose is “to introduce, explain, and defend a particular doctrine of the Lord’s Supper—the doctrine taught by John Calvin and most of the sixteenth century Reformed Confession” (p. xv). He adds, “This is not the doctrine taught in most Reformed churches today” (p. xv). Calvin’s view was usurped in Reformed circles by the memorialist view of Zwingli. Mathison argues that Calvin’s doctrine is the Biblical position and that it should, therefore, “be reclaimed and proclaimed in the Reformed church today” (p. xvi). For other reviews look here.